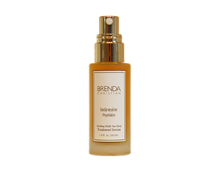 Just 10 minutes to a more beautiful and brighter you! 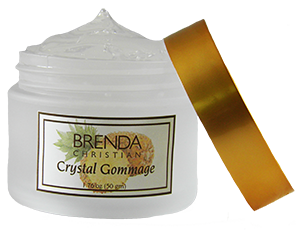 Crystal Gommage is the ideal for dissolving dead skin cells! Crystal Gommage – Crystal Gommage is a cooling, hydrating 10 minutes facial miracle that will literally dissolve dead skin cells on your face with Organic Pineapple, and Papaya Fruit and Leaf Enzymes all the while surging your fresh skin cells with soothing Aloe Vera and Glycerin. Results: Your Pores will be smaller. 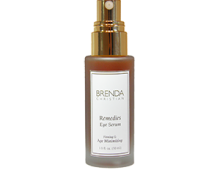 Wrinkles will appear less deep and your skin will be hydrated and silky soft. Instructions for Use: Remove one tablespoon of Crystal Gommage from the jar and apply to your entire face and neck, including the skin surrounding your eyes. You can apply with a brush, or our new crystal sponge. Use any extra Crystal Gommage on the back of your hands for a deeply deserved anti aging hand treatment. Let rest on skin for ten minutes, then lift away with purified or distilled lukewarm, not hot, water on a Tender Tuff Cloth. Follow with Peace Tonique.